Also doubles as a great early start to Black Friday. Already a hot Valentine’s Day hangout, White Castle doesn’t want Turkey Day passing you by without a chance to patronize the burger chain — so this year it’s “rereleasing” its “famous” slider stuffing recipe. Apparently invented in 1991 — the same year White Castle debuted V-Day reservations, suspiciously — the stuffing was initially the work of an enterprising employee who wanted to “enhance” her grandma’s recipe. The chain’s press release doesn’t say how her family reacted to this modification, but it must have been well, because White Castle has been encouraging people to feed their families her “classic” slider stuffing ever since. One pro is the prep is very unfussy: It’s just five minutes of ripping sliders into shreds, then mixing this burger detritus with diced celery, herbs, and some chicken broth. Can’t squeeze in a visit to White Castle, or maybe you’re nervous that, while stale bread is perfect for stuffing, two-day-old sliders sound like a much less desirable ingredient? White Castle says no sweat — just buy its frozen-aisle burgers. It has also provided instructions for a casserole option, but let’s be honest: If you’re this desperate for burgers on Thanksgiving, you really have to go full American patriot and shove that slider goo into the bird’s cavity. In a large mixing bowl, tear the sliders into pieces and add the celery, thyme, sage, and black pepper. Add 1/4 cup chicken broth and toss well. Stuff the ingredients into the cavity of the turkey before roasting and then simply cook the turkey. 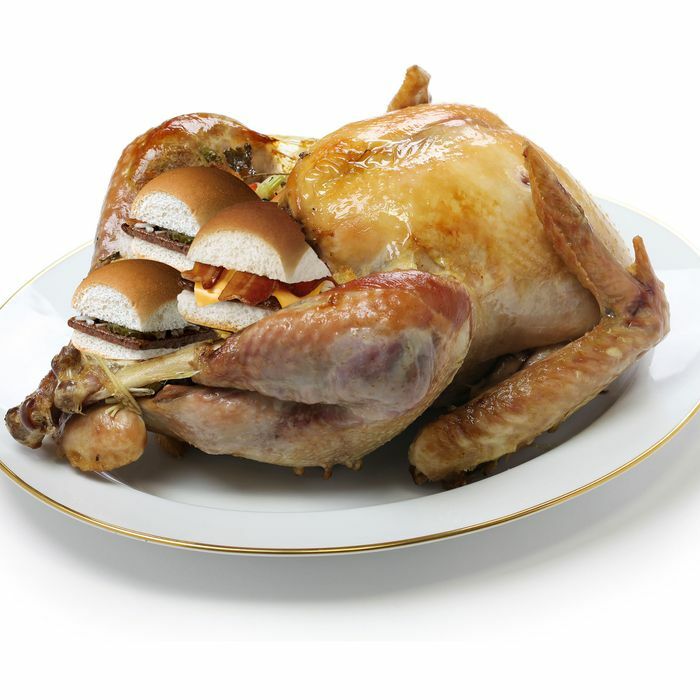 At the bottom, White Castle also notes you should purchase “one slider for each pound of turkey,” so do plan accordingly after picking up that 20-pound bird at the supermarket.